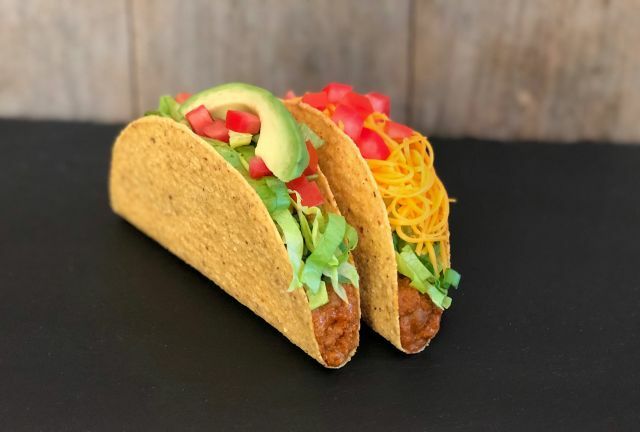 Del Taco is testing Beyond Meat, a "plant-based meat," as a vegetarian protein option featured in two tacos: the vegan Beyond Avocado Taco and the vegetarian Beyond Taco. Besides the plant-based meat, the Beyond Avocado Taco comes topped with lettuce, tomato, and avocado, while the Beyond Taco comes topped with lettuce, cheddar cheese, and tomato. Beyond Meat can also be substituted in other menu items, including burritos, nachos, and fries.